Photographer Jim Marshall captured the 1960s counterculture revolution in San Francisco’s Haight-Ashbury district with his trusty Leica M4 camera. With its rows of boutiques, coffee shops, restaurants, colorful Victorian houses, and other mom and pop businesses, San Francisco’s Haight-Ashbury district is the kind of tight-knit and diverse community where people — and legacies — linger. A new outdoor mural and indoor art gallery-style display at Wells Fargo’s 1726 Haight Street branch tells the story of the famous street’s role in the birthplace of the counterculture movement in the 1960s. The mural, one of more than 2,400 installed nationwide as part of Wells Fargo’s Community Mural Program, celebrates such Haight Street hallmarks as The Straight Theater — renovated by local artists and a popular venue for music, poetry readings, plays, and other art forms from 1966 to 1969 — and liquid light shows, art cars, rock concerts, peace symbols, and more. The outdoor mural was unveiled June 7, 2018, at Wells Fargo’s bank branch on Haight Street in San Francisco. The Haight Street mural, designed by Hana Cerkez, features images from the San Francisco Public Library, the California Historical Society, the Museum of Performance + Design, the Library of Congress, and the acclaimed photographer Jim Marshall. There is also an art collection displayed inside the branch featuring never-before-framed and displayed photos of Janis Joplin and other musicians taken by Marshall. Grady Brown, iZone Imaging: iZone imaging is very proud to be a supporter of this mural program that Wells Fargo has developed for their branches. And what we typically do is work with the Wells Fargo designers. We receive their production-ready artwork. Brown: It is manipulated to be sent to our print technicians, who then will transfer that image from a digital file into an actual printed piece of saturation grade paper. Jim Gower, iZone Imaging: Then we bring it out here to our press. It’ll be pressed on time, and heat, and temperature. It makes it one solid composite that is much denser than wood and it is very durable. It has UV coating so it can last, you know, outdoors. They’ll break it out of this press, and go down these conveyor belts, and put it on the assembly line here, where we’ll take it out and bring it over and run it around to our saws. Where they can then trim the panel down to be put on our CNCs to be cut to the final shape. Gower: A CNC is basically like a table router, but it’s a table router that moves. So when we get a board out here, this eye right here will actually shoot and take a picture of little dots that are on it, and then it will follow a cut path from the digital file that we did inside. It can also switch bits. So it can do a bevel bit, a finish bit, you know polish up the sides — all of that, all at one time as it’s cutting, so we don’t have to do hand finishing on it. and ultimately to our shipping and crating, and out the door to the job site it’s designated for, and of course on schedule. I think it’s admirable of Wells Fargo to take this initiative to bring public art, to bring history, and a community, and the vibrancy that it represents to their branches and really reflects the community that they’re serving. Maria Theresa M. Eva, a personal banker at the Haight Street branch, and her manager, Juan Carlos Briones, are excited about the mural and art display, and about the branch’s new entryway. The unusual, curved wall just to the right of the entrance now features Jim Marshall’s photo and bio against a floor-to-ceiling graphic of a psychedelic light show. Designed by Anne Marie Lapitan, it serves as a focal point for the branch. “I’m very excited and happy Jim Marshall’s pictures are at our location,” Briones said. “The Haight, as Haight-Ashbury is called by those who make it home, has a lot of significance not just here in San Francisco, but nationally, and beyond. Blue Cheer band members gather at the famous Haight-Ashbury corner in San Francisco in June 1967. Jimi Hendrix performs a free concert at The Panhandle park in San Francisco on June 19, 1967 — the day after famously setting his guitar ablaze at the Monterey Pop Festival. Janis Joplin sits atop her psychedelic Porsche for a Jim Marshall photo taken in 1968 at the Palace of Fine Arts in San Francisco. A car full of tourists gawk at hippies as they drive down Haight Street in 1967. Jim Marshall captured the band Jefferson Airplane enjoying a day in The Haight in 1967. Grace Slick whispers into Janis Joplin’s ear at Joplin’s San Francisco apartment in 1967. A light show performance during a 1966 concert by The Grass Roots at The Fillmore in San Francisco. Light show artists projected layers of colored mineral oil and water under the heat of a lamp to produce changing color patterns reflecting the music. Jim Marshall captured Grateful Dead guitarist Jerry Garcia setting up for a free concert at The Panhandle in 1967. Grace Slick rings in 1968 as the Year of Peace at the Winterland Ballroom music venue in San Francisco. As part of the June 7 dedication of the exterior mural and interior wall art collection, Wells Fargo donated $7,500 for Jim Marshall Fellowships in Photography. These fellowships fund visual reporting and research for up to eight Center for Photography students at the University of California, Berkeley, Graduate School of Journalism each year. “Jim did not have children and always said his photos were his children,” said Amelia Davis, Marshall’s personal assistant for the last 13 years of his life and head of Jim Marshall Photography LLC, which owns all the photos on display. Davis said Marshall considered himself a visual storyteller who believed deeply in equality, respected his photo subjects as people, and photographed their humanity. And now, Davis said, anyone can see the pictures by walking into the Wells Fargo branch on Haight Street, the street’s only bank. The Haight-Ashbury was originally developed as an upscale, residential district in the 1890s, thanks to the arrival of streetcar service to the neighborhood. But by the end of World War II, a number of the aging Victorian homes had been converted to apartments and boarding houses, while others were left vacant. In the 1950s and ‘60s, low rents and available housing attracted a new generation of beatniks and hippies — like-minded people who would find a new place to call home. The peace symbol was created in 1958 for the British Campaign for Nuclear Disarmament, but quickly came to symbolize peace, love, and service to humanity. These values were adopted by the new generation moving to the Haight, whose unique art and forms of self-expression created a lasting legacy. In the 1960s, light show projections played an integral part in San Francisco’s progressive music scene. Light show artists worked with layers of colored mineral oil and water heated by a lamp, and projected the changing patterns onto a screen behind live musicians. Each performance was totally unique — a moving tapestry of light and sound. Local musicians like the Charlatans, the Grateful Dead, Jefferson Airplane, and Janice Joplin made their mark on the scene. It was the birth of psychedelic rock. As the music scene grew, new venues opened their doors. A group of artists renovated an old movie theater at the corner of Haight and Cole, and renamed it the Straight Theatre. To get around city permits, they promoted it as a dance school. Within weeks of opening, crowds had gathered for poetry readings, plays, improvisational dance classes, and a performance by the Grateful Dead. Outside, the neighborhood was equally as vibrant. Psychedelic art cars and painted VW buses were a common site along the bustling street, sharing the space with artists, musicians, and with neighborhood families. The massive influx of tourists and new residents during the Summer of Love would ultimately transform the identity of San Francisco. 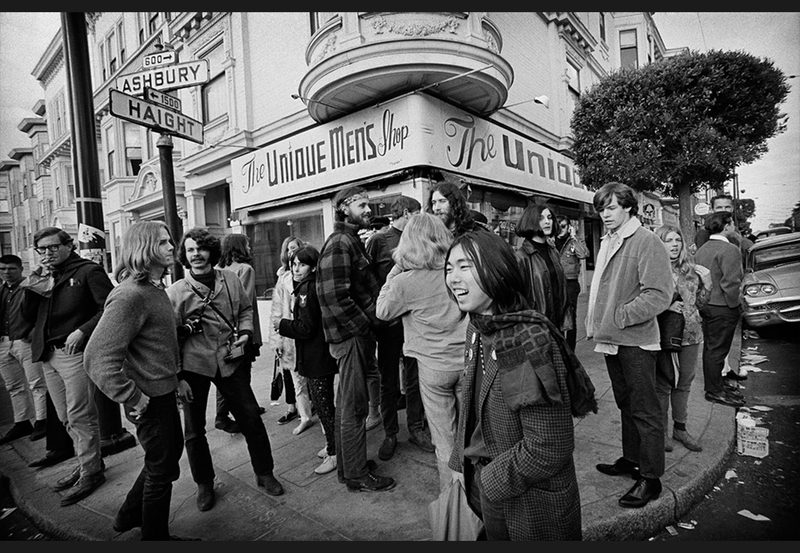 On March 3, 1968, a crowd of people gathered on Haight Street for an impromptu performance by the Grateful Dead. Legendary rock photographer Jim Marshall was on hand to capture the moment. The band set up their equipment on the back of a flatbed truck parked near the Straight Theater and performed a final farewell concert to their neighborhood. The Wells Fargo Community Mural Program is dedicated to creating unique, custom-designed historical artwork that respects the community’s legacy, celebrates its diversity, and honors the past upon which the community was founded. The Haight Street mural was dedicated on June 7, 2018 with special thanks to Jim Marshall Photography LLC, the California Historical Society, the San Francisco History Center at the San Francisco Public Library, the Library of Congress, and the Museum of Performance + Design. The Haight Street mural is the 654th in California and the 2,450th overall since the Community Mural Program began in 1998. It is also the first in the program to offer a digitized mural key that explains each image. Scanning the QR code on the key with a smartphone or other mobile device launches a narrated video tour of the mural. “We had this idea to create a mural program, with researchers who connected with the local communities on each project,” said Currie, “and they collaborated with in-house mural designers to produce the murals. Over and over, people tell us they see themselves and their communities in these art pieces, and appreciate that those legacies are being honored.